CHENGDU, China — With a growing emphasis on reliable digital transmission throughout the world, three China-based broadcasting companies have recently installed HARMAN’s Studer OnAir 3000 digital mixing consoles—two newly renovated and one recently constructed. The Sichuan Radio & Television Station Broadcasting system in Chengdu, Sichuan; the Wuxi Broadcast TV and Radio station in Jiangsu Province; and the Fujian Broadcasting Station Master Control system have all been upgraded with OnAir 3000 consoles. Provided by Advanced Communication Equipment (ACE), the HARMAN Professional distributor in China, each station sought a more efficient and up-to-date solution for their broadcasting needs. With 15 on-air rooms in the facility, Sichuan Radio purchased and installed 14 Studer OnAir 3000 and OnAir 2500 digital consoles to control their broadcasts. The master control room in the recently constructed building is fully digital and offers simulated analogue signals for backup purposes, commitment program exchanges and transmission capabilities, among other tasks. The audio system controls synchronization of the clock system, internal communications and video surveillance throughout the studio. The studio also boasts 14 pairs of JBL LSR4326P and two LSR4328P studio monitors, four JBL Control 25 loudspeakers, Soundcraft Vi6 digital console, and Soundcraft FX16ii and EFX8 analogue mixers. The analogue mixers are used for backup purposes. The Wuxi Radio station renovation included an installation of five OnAir 3000s and five OnAir 2000s, all based on Studer’s SCore Router. The digital consoles ensure transmissions distributed out of the studio are of the highest quality. Additionally, the master control system can be utilized to control the comprehensive surveillance and monitoring systems and silent alarm. The Fujian Broadcast station installed a large variety of Studer equipment, including six OnAir 3000s, four OnAir 2500s, two OnAir 2000s and four OnAir 1000s. The studio also installed 11 pairs of JBL LSR4328P studio monitors, six pairs of LSR2325P and four pairs of LSR4326P studio monitors. Two Soundcraft Vi1 16-channel digital consoles round out the equipment installed in the project that renovated six live rooms, two backup live rooms, 10 recording rooms, two dialogue recording rooms, two monitoring rooms and the master control room. 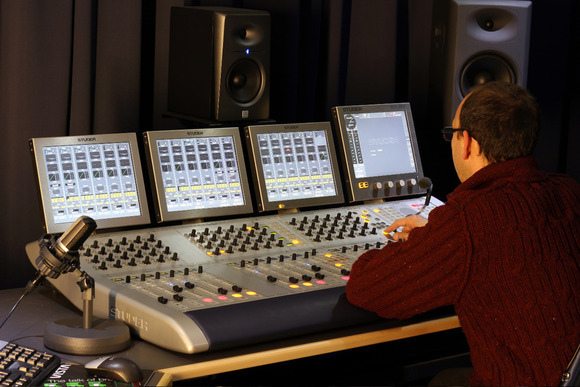 Photo Caption: A Studer OnAir 3000 digital mixing console at the Soundcraft Studer facilities in Potters Bar, UK.